Do you work for KnowledgeOwl? Learning about KnowledgeOwl? We can help. "Great way to update our employees"
I like that I am able to update the information needed by our employees as I get it. The program is very intuitive to use and take little time to learn. You do not need mad computer or HTLM skills to run the program. It is great to have customer service that actually wants to help you in a quick and efficient manner. We get great feed back from our employees on the ease to use and search. It is hard to even think about going back to the old way of doing business after being spoiled with this program. And again, the support side is always there, ready to jump in and fix what needs to be done, no questions asked. It is hard to find anything to dislike with this program. About the only thing is for some of the things that need done, it is helpful to know HTML coding, but with the support this company has, they do it faster than I ever could, saving us time and money. Get this program and save time and headaches. We use to have our employees look up manual section in Word, with no real search ability. This caused downtime while they researched and delays for our customers. With the search function alone, time was saved. And the ability to add other training links saved them time trying to find them on different web pages. "Kudos to KnowledgeOwl - we made the right choice for Level Five Selling!" 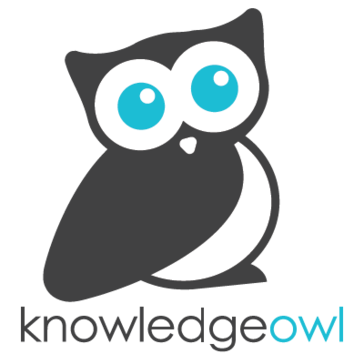 KnowledgeOwl is very easy to use - especially if you've worked with any blogging software - and the support services are fabulous. You can schedule support calls online for the amount of time you need and the team responds to emails, too. We can't sing their praises more! They're definitely a 10+. Sorry - but nothing to dislike about here. We are delighted with our decision to use KnowledgeOwl as the base of our KMS and would recommend them to other companies seeking to quickly deploy a KMS system. In starting a new company, we wanted to create a KMS to supplement our new Level Five sales training and sales coaching offering. We are using it as a market differentiator. After reviewing several KMS systems, we decided to go with KnowledgeOwl. Our reasons were several, including: easy to use, quick to get up and running, expandable as our user numbers grow, affordable and the features/functionality were a good fit with our product portfolio. "The way SaS as it should be"
Nothing so far. We are in the process of setting up or site and testing, So far, nothing has been an issue and where we needed support, it was easy to schedule and spot on. We needed a replacement for Crowdbase which is turning off their platform at the end of the year. After a through search for a replacement, Knowledge Owl came out as the clear winner on every one of our requirements. First and foremost, we needed the ability to mimick the look (to some degree) and interaction behavior that our users had become used to in Crowdbase. KO provided this. The KO feature set is actually overkill for our needs, but very solid and not so granular that a none coder can't get things done without support. However, when you need support, KO REALLY shines. They are a relatively small organization, but growing, so they can really provide personal service. If KO can find that magical balance of growth (which will come just based on how great a platform it is), and continue the quality of service, they will own the knowledge base space. 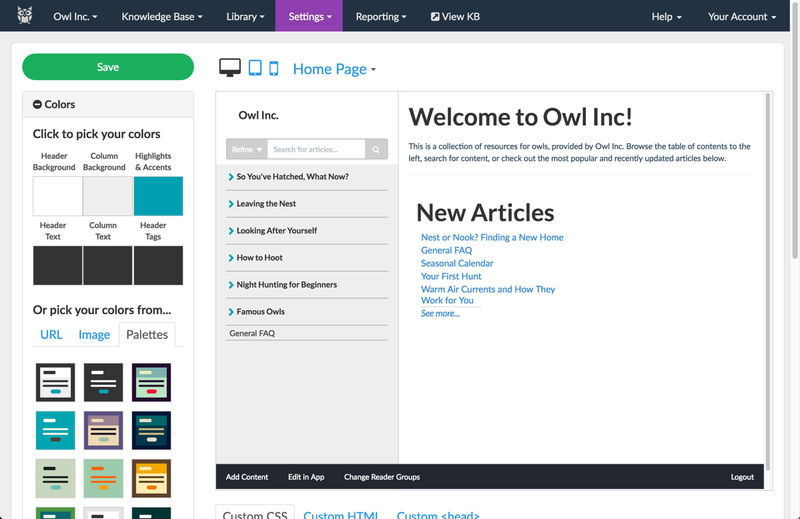 We tested a few different pieces of software for our company intranet (after being forced to move away from the outdated Google Classic Sites) and chose Knowledge Owl because the UI was simple, clean, and easy to navigate. It gave us enough latitude to shape the way we wanted to present information to our employees while also providing enough structure to maintain a professional, organized site. As the "subject matter expert," I needed to be the one to create our site, but I have zero experience with HTML coding. That being said, I can't say enough how incredible the support team (esp. Marybeth!) has been. They are extremely responsive and excellent teachers to the extent that even someone like me with no coding experience has been able to create exactly what I want with relative ease. Good customer support is a dying art, so Knowledge Owl has really exceeded expectations in this area! Company intranet, resource center, training and ongoing development. "I turned every stone until I found KnowledgeOwl!" - Superlative customer service: I am a difficult-to-please customer, however the KnowledgeOwl team is consistently able to meet if not exceed my expectations every time. - There is virtually no limit to what you can do with this app, as far as knowledge management and customer self service. Moreover, the app is easy to use, thus it will reduce your time spent on tweaking the settings and increase your time spent on writing. But if you like to play around with code, you can customize your KB to no end, from CSS to API calls. Basically, if you are not using KnowledgeOwl for your knowledge management and customer self service, it is either because you do not know about it yet, or because your company is stuck with something else. Long life to Marybeth and Pete!!! Nothing really, since when I find something that needs fixing, they will take care of it in a snap. "Easy to use by anyone and great support team !" Simple web base interface that's easy to use by anyone in the company. Great features that really help you manage the life cycle of your knowledge articles. Any questions or problem you have, just contact the support team and they are always there to help ! We have a lot of good employee that will soon retire and since we could not clone them, mapping their knowledge in KnowledgeOwl is the next best thing ! This will ensure that all those years of experience will not get lost as people leave the company. "Excellent Customer Service and Tool"
The tool is super easy for our users. Each and every time that I have had a roadblock - KO has been there with different solutions - sometimes going above what i was even thinking possible. I like that KO gives you access to style the KB to your liking - access to all parts header/css/login screen etc. nothing really. If i need something then i ask KO and their response and support is unmatched. At the start we had the need to have two separate knowledge bases, but 40% shared content. KO was able to meet our needs and create new functionality which pulled content from a single source. Another time, we had different login requirements for each KB and KO was able to make adjustments so that we could tailor the login process to each to match the internal clients requirements. On group wanted comments - BAM! KO adds the ability to makes comments on posts. I have a long list and each time KO has delivered. We originally went with Knowledge Owl because it was light-weight and did not enforce a ticketing and chat customer support as part of the package--as we use someone else's platform for these purposes. We were mainly interested in a Wordpress-y type knowledge base that would allow us to point customers and not worry about constructing a complex file structure for a knowledge base. The software's design is pretty customizable so you can have your own branding at no extra cost. There's strong typographical and design decisions that make complex workflows easily readable by customers. The design themes and interface aren't hugely modern and don't feel terribly resilient sometimes. There have been some security concerns as well: for a while, if you googled "knowledge owl login", Google would provide you with a link that looked like Knowledge Owl and would accept your credentials, but it would not be pointing at knowledgeowl's domain (as far as I could see). Occasionally the UI on the administrator end was not quite as intuitive, but on the whole things were discoverable. We're B2B SaaS and we offer customer support through a chat line. KnowledgeOwl worked great for us because we didn't want an entire system that included ticketing, but we wanted something that would play nice with our DNS and allow us to point customers to more complicated workflow education. Knowledge Owl hit that sweet spot, and it's freed up our time significantly to do other important things (development, sales, meaningful customer interaction). "A wise choice for your knowldge base. " For anyone who has used KnowledgeOwl one of the first things you will notice is it just works. The setup and usage are super intuitive and I have never once needed to ask for help in how to set something up or use the application. - Well done! You have granular control over access to your knowledge based to make this either internal or public facing and can even have as our organization does sections for each team. Our organization uses KnowledgeOwl as our customer facing knowledge based which our customers LOVE as well as a tool for internal documentation to house a library of articles and how to's for our new employees and remote workers. Each of our departments has their own KB which put relevant knowledge within easy access for each employee while ensuing for security of more sensitive information. I have tried to think of what life without KnowledgeOwl would be like and indeed it is a stark existence. "Easy to use solution for central communication and documentation"
Foldering/navigation, versioning, ability to restrict access by IP or password, ease of use of the editor, ability to customize look/feel of the knowledge base using the robust bult-in style editor as well as custom CSS (this is a big one for me). I honestly can't think of anything! I've never run into any issues that couldn't be easily solved by contacting support or searching their documentation. My company uses KnowledgeOwl for customer-facing documentation, and it's been an invaluable resource. It is so incredible to be able to copy/paste a link to or a section of a document, instead of repeating ourselves over and over again for common questions in chat/tickets. The amount of documentation we have written (and how well organized it is, thanks to KnowledgeOwl) has also greatly reduced the need for our customers to contact support. So awesome! My department also uses KnowledgeOwl for internal documentation/communications, as well as housing documents/processes the entire team needs access to. This has been great for streamlining communication, keeping things consistent and accessible, and making sure everyone is on the same page. We love it!! "Excellent product and great support"
Everything, basically. The product itself is easy, straightforward, and intuitive, and good new features and functionality are always being added. But above all, I love the staff and support. I feel like Marybeth is practically part of my own team at times--she always gets back to me quickly and offers a variety of solutions to a problem, and the team at KO has been great handling some custom requests or fast-tracking things we desperately needed. Honestly there's nothing to dislike here, though I cannot wait for the new editor to be out of beta and permanently live! Definitely do the free trial--we ran several PoCs off of the trial and Marybeth and Pete helped us play around with different ways to import all of our existing content from our previous vendor, etc. And if KO doesn't currently do something you want, explain it and ask them about it--they've been great to us! We use KO for the help documentation for our own SaaS application. Most importantly, the API and the "pages to recommend on" functionality has allowed us to provide an in-app contextually relevant help menu for our end-users, which has made our own help documentation much more user-friendly and readily-accessible (and has increased its usage). 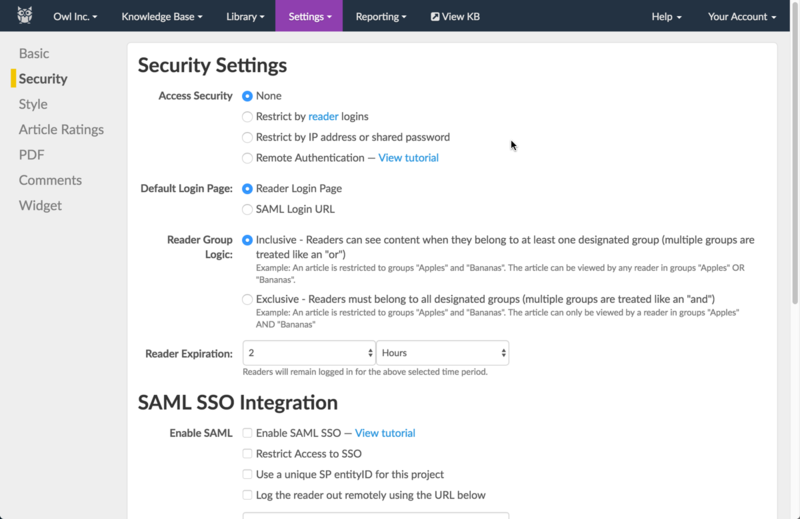 I work as a freelancer and I do some work for Salsify, and I've found that Knowledge Owl is incredibly easy to use. Whether I'm uploading new article content, swapping out images, making revisions, etc., it's super user friendly. I like that I can use multiple instances of Knowledge Owl and while the content may change, the overall user experience remains the same. There isn't anything about Knowledge Owl that I dislike. 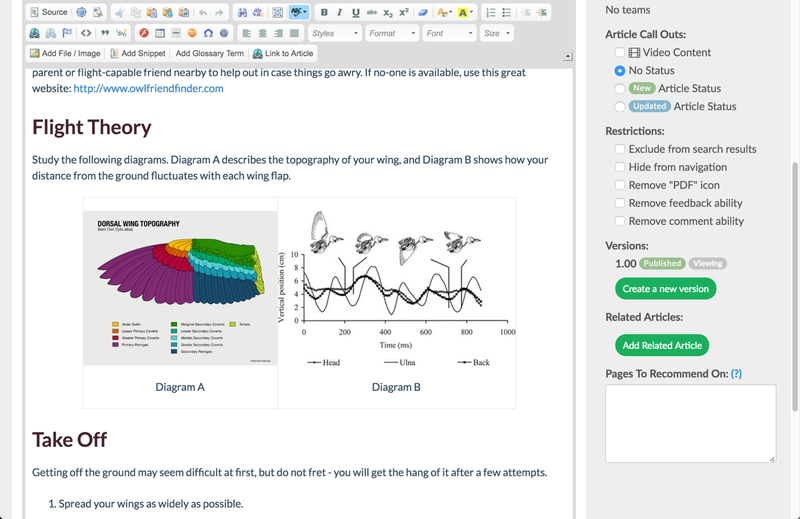 Each of our customers has a version of knowledge owl that they can access that walks them through a variety of articles, instructing them on how to use the Salsify software. Each instance of KO is specific to a customer so the actual article content may vary from customer to customer. Some information is standard, across all clients, so while we can upload or create general content that everyone can use, we can also have specific information based on the client. "Extremely Powerful and Well Designed Knowledgebase <3 "
I love the flexibility of the application, the support, and most importantly how it helps me solve communication problems. I love how agile the application is and how they're constantly making awesome improvements. It's also extremely easy to use. I REALLY love their new owl too. His name is Linus and he's adorable. Everyone needs a Linus. I don't have a negative thing to say about this company. They're epic. I've spent so much time in KO and am always so pleased. If you feel like you're repeating yourself frequently, or even need a place to store important processes, procedures, ect KO is amazing. I've used other knowledge bases in the past with other companies and this company blows everyone out of the water. KO has my heart! I'm primarily solving communication issues. I help to create efficient documentation. The benefits are that our company and customers have resources to documentation. It also saves many people in the company time as well as prevent a lot of redundancies. KnowledgeOwl offers very responsive and helpful customer support. If I ask about a feature that's currently unavailable, they'll put in a request with their Development team to implement it within a few weeks. Their product is easy to use and if I have any questions, our rep is always quick to respond and patient with me. The product itself is extremely easy to use, but offers a lot of nifty features and they're always introducing new ones. There's not much I dislike so far. KnowledgeOwl is still growing, so they might not have all the features you're looking for in a similar product, but they'll get there, especially if you specifically request certain enhancements. This is an excellent product for anybody who's looking for a knowledge base that's easy to use, but comes with lots of cool features, while not being extremely expensive. Our company needed a knowledge base system for our product documentation. Putting this information into a knowledge base refreshes our help content and helps match the technology we offer with our products. KnowledgeOwl is very easy to use for technical and non-technical personnel, very flexible (branding/ theming) and, overall, very fast. I have reviewed comparable solutions, but KnowledgeOwl was perfect fit for a small technology company like ours. Finally, the support we received has been awesome. KnowledgeOwl does not support multi-languages directly, There is a way for developer to check for browser language setting. Although, this is doable, it makes the page very hard to maintain, and having a regular translator working with knowledgeOwl is far fetched. The best part of knowledgeOwl is the flexibility as an administrator: You can access almost every portion of the portal and change it to suit your exact needs. For instances, we needed to add a JScript to support displaying mathematical equations, integrate widgets from Zendesk, and other vendors, everything was accessible and right there. We are hosting the support portal for NumXL SDK. The team at knowledge owl was very helpful when I was looking for an easy to use content management system. I needed something that not only I could log into and use; my team uses Knowledge Owl as well. The support staff at knowledge owl helped me customize the CSS of my site, and they are always there when I have a question. Back-end layout is easy to use. User-facing content looks fantastic, and my users are very happy with how my knowledge base looks. Would like more CSS control over individual pages. More user friendly if you have other people than technical writers working in the CMS. I can have non-writer colleagues edit documentation easier in Knowledge Owl than in a DITA structure, etc. Needed a knowledge base. Now I have a functioning knowledge base with user docs, troubleshooting guides, videos, and various other resources. 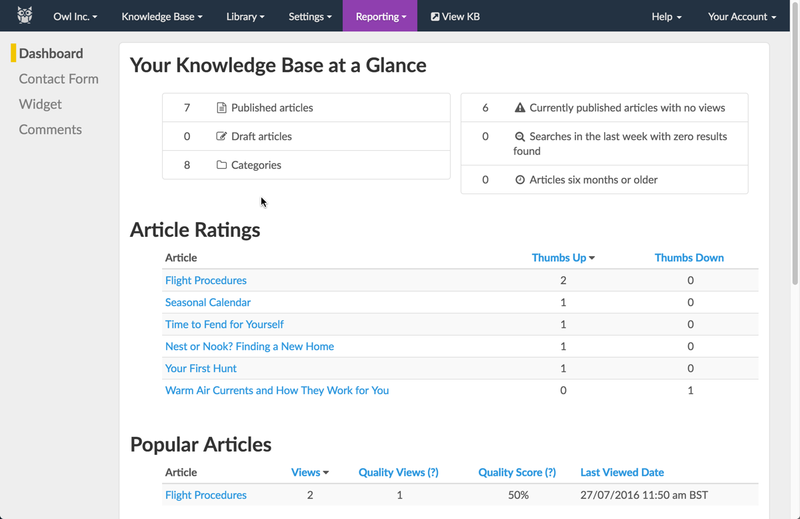 "KnowledgeOwl - Helping to make 'Help' simple yet powerful"
Efficient Content Management, ability to customise the UI and to use the API to integrate with our service desk. I also find that the product team are continuing to develop the product and their response to customer's needs is extremely agile. There's room to improve the reporting and ability to share content across multiple KBs. If you are looking to build or migrate a knowledgebase to a platform that will support better usability and more efficiency, then give it a try and you'll realise straight away how easy it is for any member of your team to get it setup and going. To easily manage content-heavy help resources and to quickly and easily deploy variations of the same KB for different clients. Also to interface with our service desk for managing customer requests. There are many good features about this tool... from an admin perspective, I like the drag and drop Table of Contents, how easy it is to create an article; and, how quick it is to update it. Working in the cloud is the BEST! There really isn't anything I dislike. This tool is so easy to use. Just try it. I have used multiple tools in response to our need for Performance Support and I highly recommend KnowledgeOwl over any other tool I have used, Ontuitive and RoboHelp to name the two main ones. Performance Support for sales and operations teams worldwide. Most of our processes are the same or similar, but, it is still easy to copy and article and update it for regional differences. Easy user interface that allows for quick and efficient use of the product. Their user support was also very helpful. Searching for an article is always great. I like the setup of the product. It's really a create user interfact. Providing our clients with an in depth understanding of our product. Clients are more self sufficient and less likely to contact support for easy day-to-day issues that can be addressed in the knowledge base. We also supply our clients with links to other important files using Knowledge Owl. "Easy to Implement and Maintain"
We've used knowledge base for almost a year now as a tool for students and employees to find information. The best things about Knowledge Owl are 1) How easy it is to create and manage content and 2) The support provided by the team at Knowledge Owl. I do wish the analytics were a little more robust but they do have documentation on how to incorporate Google Analytics, which has been helpful to us. We are now able to provide 24/7 self-service for our students so they can easily locate policy and process information. As an online institution, it's important for them to find what they need, even when there isn't a live person available. "Documentation is a breeze with Knowledge Owl!" I love that Knowledge Owl has such an amazing WYSIWYG experience (or HTML dump), you can drill down into multiple knowledge bases with sub articles, and the search is fantastic! The Support is so amazing as well, the team really knows their stuff and is so helpful and prompt! Oh! The roles you can set are fantastic as well, because they make it so you can have lots of different types of users -- read only users (public) vs editors and writers! I would love a few more API capabilities. Try it out! They have non-profit discounts as well, you won't find a cheaper, more easy to use software than them. Easily made documentation. People tend to shy away from making documentation because it's "too hard" or "takes too much time". 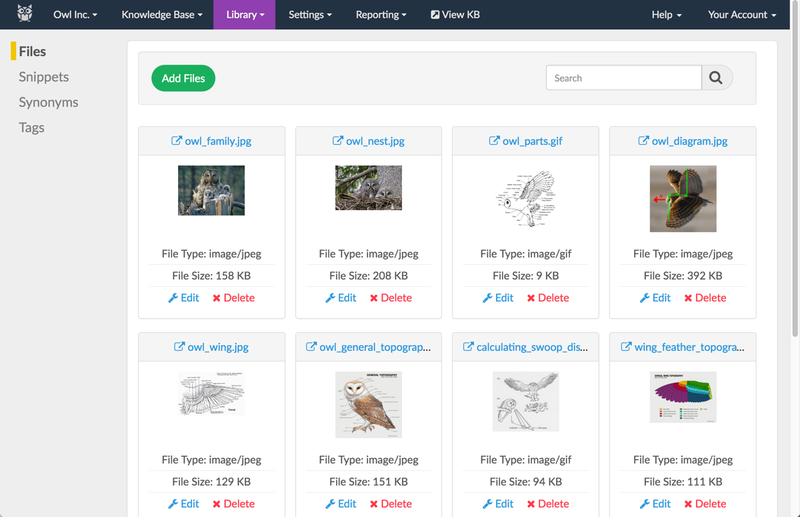 Knowledge Owl helps make things easy for people with no html experience, or all the HTML experience make beautiful documentation easily. "Solid Knowledgebase for Small Teams"
I liked how easy it was to store things into Knowledge owl as well as the ease of use for new employees to access the information. The interface is extremely user friendly and easy to navigate. I didn't like the process of having to add each person as a user rather than giving everyone in the org access. Our knowledgeowl subscription only allowed for a few subscriptions which meant that we were constantly adding and removing people to ensure that everyone could access what was needed. We got all of our documents in one general area and it helped us to organize our knowledgebase as well as new hire documents in one space. "Affordable tool, great support team"
The development team has always been very responsive to questions and concerns. When an issue has been brought to their attention, they have consistently striven to respond and correct the issue promptly. It also helps a lot that the solution has been affordable, which allowed me to convince my company to give it a trial run to show whether it has value before they commit many resources to it. I very much dislike this "dumbing down" direction that many software companies are trying to take, as it frustrates and alienates the more tech-savvy users who prefer the more "Windows" or "Android" style of app information being accessible and customizable. Would rather the developers put effort into either a useful functionality for my organization, such as a mobile app that can sync the database contents when online and store them for offline use. Or that they spent more time in identifying and correcting several of the unexpected behaviors that continue in the software, such as an inconsistent and unusual Glossary term matching in articles, or what seems like a relatively poor article search engine (displays top hits that lack any words used in the search, while other articles have been created with those keywords in different order in the title/article tags/variations of search question/and synonyms for the words defined...). Evaluate the needs of your company as well as your budget. Knowledge Owl is a great tool if your needs revolve around a smaller organization or smaller number of authors, you want something that makes creating content relatively easy (compared to something like a wiki) and you have a relatively limited budget to work with. Be aware that the product may not be completely mature though, which is offset by the lower cost of the product. I'm roughly 6 months in to beginning the service and due to not being able to have many authors for content, have held off in letting our end users know that this knowledge base exists so they wouldn't go look and then decide that content was so sparse they would never return. It's a tough crowd of a few hundred potential readers who are based in the "field," often have spotty Internet access and don't have much time to waste (a stark contrast from some people in an office who may have a little knowledge base.) I'm actually presenting roll out to users tomorrow! If similar projects I've worked on have shown anything, there will be slow adoption by users, so it will likely take at least another 6 months before there is any hope of deriving some sort of possible improvement in our support case data that we track (i.e. "did having knowledge owl make a difference?") There are often no second chances to make first impressions with these kinds of things. Hoping that this builds value and prevents our users from having to make return travel visits to customer accounts and helps them resolve issues with knowledge rather than deciding to RMA equipment that has nothing wrong with it. "Integral to my Job! Excellent software"
KnowledgeOwl is essential to how I communicate with my team, offer documentation, and make sure that we're all on the same page with process. It's easy to see that KnowledgeOwl is made with love and the decisions they make on how to build the software, what features to add, and how to implement them is driven by a deep desire to know how their users work and what they need. If I didn't have KnowledgeOwl, we'd be lost at sea. KnowledgeOwl lets us help our customers with ease; it lets us be strong as a team and consistently give the best information and the best support possible. We use KnowledgeOwl to write customer documentation and internal documentation for multiple departments. This has helped us solve a lot of internal communication challenges, provide excellent documentation for our support team to in turn provide great service to our users, and also provide world-class documentation for our customers. The benefits we have realized are astronomical. The key one is that we can document our processes, our software, and anything we need to track in one, easily organized, easily searchable, easily legible location. A benefit for our team is that when we have new employees join our company, they have an excellent resource already available to them to quickly and throughly get up to speed with how our company runs. Onboarding to our team is a snap with KnowledgeOwl. The search feature allows our customer base to easily find what they are looking for instead of scouting all over the site. We use the LOGIN button which is located all the way to the right of the screen. If it were closer to the SEARCH feature, the customers would be able to click on it right away before using the SEARCH. This has been our biggest complaint from the employees that have used it since implementation. We, as a school district, train over 9,000 employees and are constantly improving our resources. This application has allowed us to do just that by making it so easy to revise resource material on the backend. The ability to structure the articles exactly as you see fit. Nesting different collections into categories that can then have articles inside is amazing. The statistic and reporting elements are a bit weak at the moment. Currently the stats that are shown are Views and Quality Views. Would love to see a actual average time spent on article. Most common place they came from (search, category, other article) and most common place they went to next. KnowledgeOwl has been an incredible company to work with. Their support is crazy fast and extremely helpful. Their offering for a knowledgebase is second to none. They have a huge range of features and functionality, and they seem committed to expanding based on customer demand and feedback. Providing self-serve information to customers looking to learn more about our product or looking to seek a solution to an issue they are facing. We needed a way to quickly and effectively produce and share support documentation and walkthroughs with our customers. , great customer service: team responds promptly. Requests for help are answered through email. I had a hard time using the color picker when referencing our corporate website. It wouldn't automatically pull in the colors. Also notable is the feature for adding jpegs or other graphic files to the articles: you have to add them to the library by using an attachment-like feature for importing from you local files. This adds the file to your file library, from which point you must add it to your articles. This could be made into a shorter process by adding drag-drop file upload maybe. A great solution if you are looking for Knowledge Base core functionality. Trying to prevent calls to our help desk. "I think KO is a GREAT VALUE... I use it all the time and enjoy. " I don't love the table features... sometimes it's difficult to work with... especially copy paste of Excel. I wish it had some better options for formatting tables. Make sure the admin takes appearance very seriously... it can be a very good tool when used correctly. Communication to Sales & Marketing in a fast paced, always changing industry. I'm able to make changes with date stamps that allows user to know they are up to date with information. I also love the terms section. "Amazing Backend and Customer Service"
Knowledge Owl is comprised of compassionate, dedicated, and talented staff - and it shows in their product. The software is user-friendly, and customer-centered. The software allows companies to meet their needs, wants, and grow as necessary. If you have questions, someone is there to answer, fix, and help. Nothing. There's literally nothing in my experience working with them that I dislike. They're amazing. We needed three separate knowledge bases that serve various stakeholders for various purposed. We needed to access and manage both content and users in one simplified space. And Knowledge Owl provided us that space. They also worked intimately to rebrand and customize features for us. Hard to say, but perhaps the WYSIWIG editor (again this might be outdated info) tended to do some strange things to the source HTML sometimes. I generally only worked in the source HTML after a while. "Incredibly competitive offering coming from a small team"
KnowledgeOwl seems to have an incredible keen sense on what people are looking for in a knowledge base tool. They make a point of doing this really well, and not clouding it with other services/solutions that impact their ability to offer a great tool. If there's anything we dislike, we reach out to them and they have a solution for us quickly. Reach out to them! They're very happy to help assist with any questions you have. We wanted to offer our users the ability to find answers to many questions they were looking for, without necessarily requiring reaching out to our support team. This helped expand our self service option so that we could focus our time on other areas of our business. This helped tremendously as we are a small team. "Easy to use with good support"
FAQ and index pages - could be prettier! We needed to provide an online knowledge base to support our web platform in realtime as we are an agile tech company who release updates and changes almost weekly. Our solid state solutions weren't able to keep up and weren't scalable so it was time to move our help online. Using Knowledge Owl has enabled us to make regular updates to our platform support documents as the site develops and new release are launched, in a professional, easy to manage way. Relatively easy to use, logging into the editing portal is easy. I do not like that pasting is not a seamless process and keeping/changing formatting upon doing so is very difficult. Countless times I've lost work when creating content because I've had to move away from Knowledge Owl and was logged out and this work was not recovered. This is extremely frustrating. I've also noticed that the formatting has changed in articles I've created in the past where the anchor and links are no longer showing up as they should. I will have to go back into all of my articles and make changes. Knowledge owl has allowed us to create articles to use internally allowing staff to self serve. "Excellent service and customer support"
The team at KnowledgeOwl is one of the best I've worked with! They are quick to respond, always helpful and going above and beyond to offer support. Nothing! I think everything I've used so far has been great. I'd definitely recommend KnowledgeOwl. Everyone is so helpful and the system is a wonderful way to share knowledge with customers. We've been very happy with the customer support especially, but also the software itself. It's easy for customers to use and easy to input our data. We are using KnowledgeOwl to offer a service that helps families navigate the college process. The system makes it easy to support clients and provide all kinds of knowledge and information. Linked articles are really useful. When I copy and paste text, KO adds spans with formatting info. I want to be able to copy and paste without any formatting (CTRL-SHIFT-v). Synonym library doesn't allow spaces, so I can only add single words. I want to be able to add multi-word phrases (for example: end user). Ability to use related article feature without autogenerated related articles (I want to choose which articles are in the related articles category). Ability to convert categories to articles. Search could be a lot better. Better wiziwig - easier access to source/output comparison. Need better versioning options for categories. It lacked support for many standard product documentation authoring and user features. It lacked support for implementing modern web features. Topic versioning: multiple versions of a topic can be in draft form. Content reuse: dynamic templates, snippets to keep all content in-sync. Semantic styling: tagging of content bits for easy restyling. The team -- they helped a lot with customizing their interface for our needs, and are super helpful with custom coding work and so on. Also, the look is "fresh" and the interface is easy. They've also been very responsive when we've run into issues. The solution is great, simply put - it works. I love that it's web-based and that there is no XML or download required, and that anyone can log in and figure out how to use it. I dislike that other users require extra payment. I think you should allow at least 2 users (one to write, one to edit/approve). The integration with Zendesk broke at one point, so we had a lot of tickets going to "nowhere" and didn't know it. We only found out when we started receiving comments about not responding to help requests. Once we found out, the team at KnowledgeOwl was super fast in looking into what happened and ultimately we removed the integration altogether. There was no way to review the tickets sent/forms completed, so that is something they could add - an internal storage somewhere. If you need a lightweight solution, no software or XML required, and have a single product offering, it's a great tool. You pay for every "knowledgebase" you offer though, so if you need multiple solutions you may want to look into the heavy hitters in this space. It's our help system for the users of our product. We also use a hidden category for our internal release notes. The technical support I receive is outstanding. As for the system itself, I'm not a very technical person, but the system is very easy to use. Customizable to whatever your heart desires. From a user perspective, it is very easy to navigate around and find sources of information. I would like to see the glossary function updating to the articles working better. I would also like to see a way we can easily link a document from a drive to an article, either a word, PDF or spreadsheet. We are using this piece as a central location for all company documentation including policies, procedures, contacts and will use this for training purposes. The only wish I had, is to have found this product sooner! We have been very lucky to experience rapid growth due to our unique approaches in our industry. Unfortunately, rapid growth is very dangerous for many companies, because the growth distracts them, and they lose sight of what made the successful in the first place. We were desperately searching for a solution that would allow us to retain and promote our culture in a simple, but powerful, knowledge base platform. We tested many products, but Knowledgeowl was the simplest and most effective to use. In addition, the support has been incredible. I really feel like they are in this with us, not just selling a product. I highly recommend this product! Being able to create, share, update in-house articles. Able to export PDF versions or share links. The company is responsive in a timely manner and works to make adjustments to meet our needs. Nothing at this time is disagreeable from my perspective. I'm not involved with invoicing, network implementation, etc. so can't speak to that. Provide an accessible site for our staff to read articles and get help. It's a clean, searchable interface that is more modern and flexible than our previous space.